Science has proven this map wrong. That fact will not persuade those who WANT this map to be true. Oh Sweet Jesus on a bike, where do you even start with this one haha. Why…how…I mean…you know the curves…the oceans…oh poor Australia. Can we tie a string between Canada and South America and hang decorations from it at Christmas? 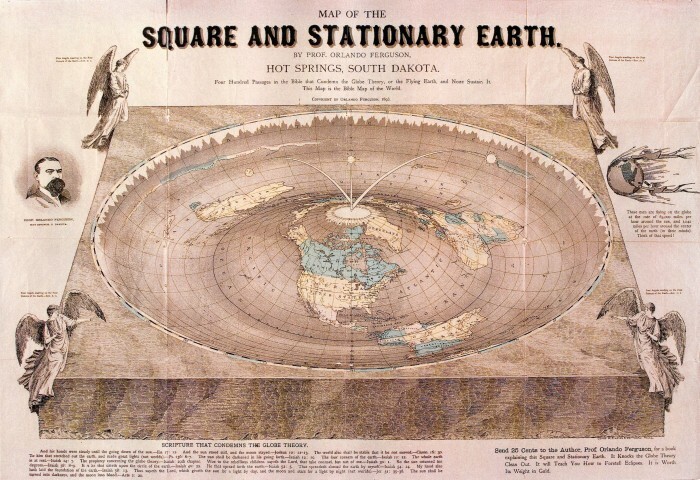 Flat-earthers reinvent base physics to fit them to the flat earth model. They were made to believe a small sun floats above a flat surface, and that the daylight at one side is not visible at the other side of the earth-plane. So they are reinventing how light behaves. If that theory where true, we would be able to see the sun permanently, the same way we are able to see other celestial bodies in the nightsky. But we don’t see the sun. On a flat Earth model the sun never dusks and still you can’t see it at night.